← Aviator Brewing Company in Fuquay Varina to Hold New Brewery Grand Opening Party May 1, 2010! 2nd Annual Cuegrass Festival Even Bigger Than The First! 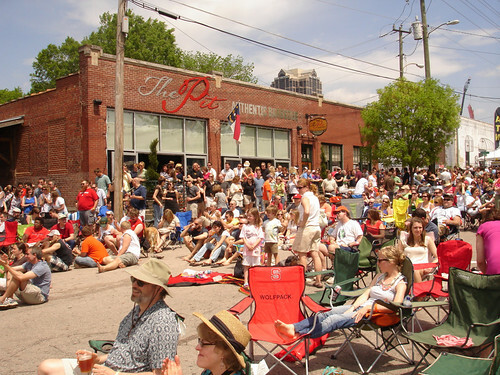 This past weekend marked the second Cuegrass Festival with the The Pitt closing down W. Davie Street in Downtown Raleigh to celebrate the best in BBQ, beer, and of course Bluegrass music. I arrived at a little after 11:30 to meet up with some friends and there was already a nice crowd gathered. I quickly decided to jump in the beer line to wet my whistle before the lines grew too big. I discovered they had changed the beer tent set-up and had a very efficient system in place to ensure parched festival goers could get their favorite beverage without enduring much of a wait. I was happy to see they featured North Carolina beers from LoneRider, Mother Earth, Carolina Brewing Company and Big Boss. The BBQ was provided in an efficient manner as well. 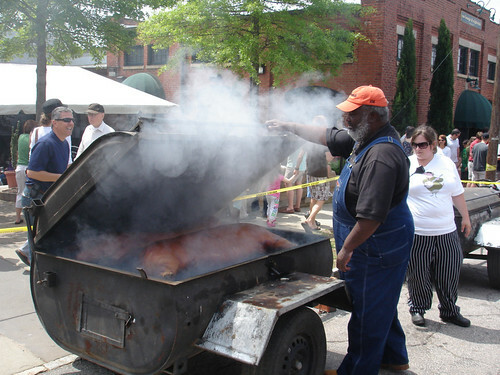 They had sectioned off a large parking lot area off to the side where they had several “pig cookers” smoking away and the staff prepared the food and shuttled it over to the Cue’ tent were it was quickly distributed to hunger patrons. The layout of the festival is pretty simple. People bring chairs and blankets and line up along Daive Street wherever they can and settle in for a great day of music and food. 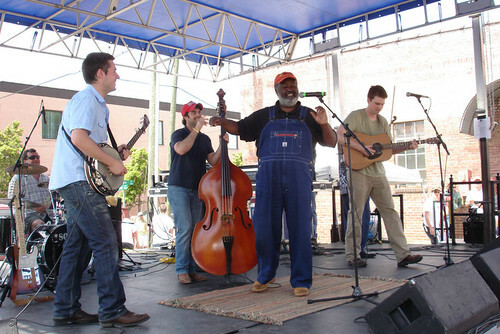 The music was non-stop with a series of local and regional bluegrass acts jamming bluegrass tunes from the Stage on W. Davie Street including music by Southern Culture on the Skids, Old Habits, Jackass Flats and Sons of Ralph Duo. My favorite is Old Habits, which was featured on television last year when Ed Mitchell, the Pit Master, took on and defeated Bobby Flay on “Throw Down with Bobby Flay” on the Food Network. At one point Ed jumped up on Stage and thanked everyone for coming out and hinted that the festival has gotten so big that next year it may move to Fayetteville Street! Here is my favorite shot of the day. Ed checking out a smokey pig cooker. He gave a big thumbs up to the crowd after this pic was taken letting everyone know that he liked what he saw. To check out all of my pictures from the 2010 Cuegrass festival check out my flickr photo album. Great photos! I had to miss it becuase of my schedule this year but I hope to be there next year! I had no idea SCOTTS was part of the line-up. Did they do the 8-Piece Box dance where they get an audience member on stage? I didn’t catch that, but perhaps I missed it while waiting in line for some Cue’ and a beer. Sounds like fun. It was a great time and sounds like it will be even better next year!